Circuit breaker tripping might be something of an annoyance, especially when it happens at inconvenient times. Still, it is much better to have a circuit breaker that trips as opposed to one that doesn’t cut the power when it should. Circuits can safely handle a certain amount of electricity, but we often don’t realize just how much of a load we’re putting on them. All too often we find ourselves plugging in one appliance too many, only to end up in the dark as the circuit trips! No one enjoys being in the dark, but your circuit breaker is doing the very important job of helping ensure the safety of everyone in your home. It’s important to understand what a breaker does and why it’s so crucial. It’s also vital to have an understanding of what it means when they keep tripping. 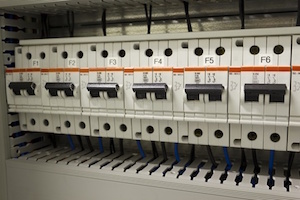 What Causes Circuit Breaker Tripping in the First Place? If your wires have more current flowing through them than they can safely handle, they could potentially overheat. This can lead to a few different outcomes. The wires could malfunction and lose their ability to work. This means repairs would be necessary before you’re able to utilize that particular circuit again. Another possible result of excessive electricity is the melting of the protective insulation around the wiring, which leads to exposed metal wires. This exposure can cause fires, as well as an increased risk of electrocution. The circuit breaker should recognize when there is too much current present in the wiring. When the breaker detects excess electricity, it trips, cutting off power before the extra current can lead to any safety issues. What Should You Do in the Event of a Tripped Breaker? If your circuit breaker has tripped, turn off the devices that were running when the power shut off. To reset the breaker, you may need to slide it all the way to the off position (a tripped breaker will be somewhere around the middle) and then back on. If it doesn’t reset, it could mean the issue is still present on the circuit. If it resets and then trips again right away, there might be a problem that requires the help of a licensed electrician. On the other hand, if the breaker resets, you should then test the various light switches and appliances present on that particular circuit. If turning on a certain light causes another trip, there might be a short circuit in one of the fixtures controlled by the switch. If turning on an appliance leads to a tripped circuit, that appliance may be defective. What Does It Mean for My Electrical System If Breakers Keep Tripping? It’s easy to think you can just reset tripped breakers and forget all about them. While this might work for the short-term, it’s not a very safe practice. If your circuit breakers trip more often than usual, ignoring the issue is a very bad idea. It wouldn’t be tripping so much unless something is wrong! The unfortunate consequence of circuit breaker tripping is that people often believe they are solving the issue by resetting them. However, until they address the real problem, it’s not going anywhere. If the same breaker keeps tripping, it could mean there is a short somewhere on the circuit. It could also be an indicator of an appliance drawing too much power. This tends to happen when an older device loses some of its efficiency, which can be a big drain on energy in addition to an electricity issue. Circuit breaker tripping could also be caused by a problem with the wiring in general. If you live in an older home, you might have outdated wiring. The problem with older electrical systems is that new technology and appliances tend to require more power than these systems can safely accommodate. As we need more and more energy in our daily lives, the older wiring can’t keep up with the new demands. If more than one breaker is constantly tripping, this could very well be the culprit. Otherwise, it could be an issue with the breaker panel itself. This would require an involved, dangerous repair process that only professionals should attempt. If you’re certain there’s a problem but unsure of how to identify it, don’t leave anything to chance! You could be risking the welfare of your home, as well as your personal safety. Once you decide to get the help you need, the next step is choosing a reliable expert to get the job done. At Bryan Electric, our experienced staff is more than capable of identifying the issues causing your circuit breaker tripping. We’ll get them repaired once we pinpoint the exact problems at hand. Give us a call at (770) 680-2144 today!